Use of Exergen’s unique patented, non-contact infrared sensors solves past technical difficulties associated with temperature measurement of shiny, uncoated metal rollers (due to the high infrared reflectivity of the uncoated metal surfaces). 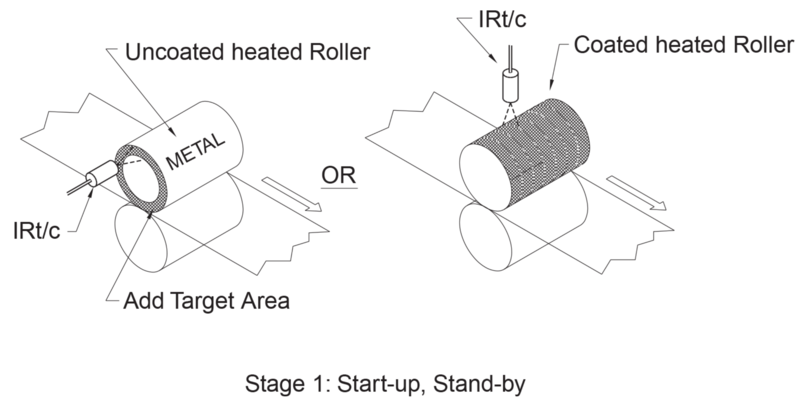 Exergen has developed and tested a two stage approach to accurately measure and control the heat output of heated (or cooled) metal rollers using our IRt/c’s—even at very high speeds. During start-up and stand-by conditions, the temperature of the heated roller will become fairly uniform throughout the roller surfaces. Because of this, the temperature can be reliably measured at any convenient location on the surface, or the edge, of the rollers. So, for Stage 1, simply install an IRt/c so that it can see a reliable signal from the roller. (c) or the addition of a thin hoop, or ring, of black, hard-anodized aluminum. Install an IRt/c to aim at the center, or any convenient location, on the surface of the roller. For Stage 2, install an additional IRt/c sensor to look directly at the web surface after it contacts the heated roller. As the web begins to move, (or, at a preset rpm) the temperature control system for the roller should be switched over to a control system connected to this IRt/c sensor. This IRt/c sensor should be mounted so that it looks at the side of the web material that is heated by the roller. For webs heated on two sides, sensors should be mounted on each side to control each heated roller. For wide webs: multiple IRt/c sensors can be installed across the web. For multi-zone rollers: use at least one IRt/c for each zone across the web. Temperature Measurement Errors - errors due to incorrect temperature measurement. Heat Transfer Errors - errors caused by variations of heat transfer to the web. • Web material changes in thickness, moisture content, etc. As the roller speeds up, heat is removed from the roller surface by the web material. Temperature gradients appear inside the roller, and on the roller surface. Conventional embedded, surface, or edge temperature sensors cannot adequately track and compensate for all these temperature variations, nor can they adequately measure the amount of heat transferred to the web material. Exergen’s Two Stage IRt/c Sensor & Control System automatically reduces all these sources of web temperature processing errors. Thus, the actual temperature of the webs can be both tightly (to within a few degrees) and consistently controlled through the use of IRt/c sensor technology. The rugged IRt/c sensors need no power supply, no periodic calibration, and are designed for years of trouble-free operation. For additional technical assistance, please contact Exergen.